TouchPoint’s Online Registration is fully integrated into your database. That means that every registrant will either already have a record/profile in the database or one will be created during the registration. Also all registration information is stored in your church’s database. Depending on the information itself, it is stored either in the person’s Member Dialog on the registration organization, or on the person’s Registration tab on his people record. Every registrant has the option to Log on to Register or to fill in the fields presented. If you email any of our RegisterLinks to those you want to register, the person does not have to make a decision regarding logging on or not. When he clicks the link it is as though he is logged in, but without entering his username and password. We highly recommend you use these links. Also, there are some settings that will determine what is presented when someone clicks a public link on your website. After pressing the Log In button the registrant will be asked to enter his username (or email address) and password. When you log in to register, the system knows who you are and will populate any answers that are retained on your Registrations tab if you have answered them previously and they are asked during that registration. These are questions such as Emergency Contact, Physician, Insurance, Parent’s Names, Shirt Size. Also, when you complete your registration and click Register Someone Else, you will be presented with a list of your family members. Just click on the one you want to register and you do not have to find that person in the database. If you go to the Log In page to register and realize that you have forgotten your password, just click the Request a Password link. You will be asked to enter either your username or the email address on your people record to be sent an email to reset your password. Or you can select the Register without Logging in option. When someone is registering online and is not logged in, we have to know for sure that this is the correct person. That is why this ‘find’ process is different than what a staff member experiences when using the Search/Add process inside the database. In Search/Add we will display a list of people that match whatever criteria you enter. For online registrations, we obviously cannot do that for an anonymous person that is registering. How we match records for this process is described below. 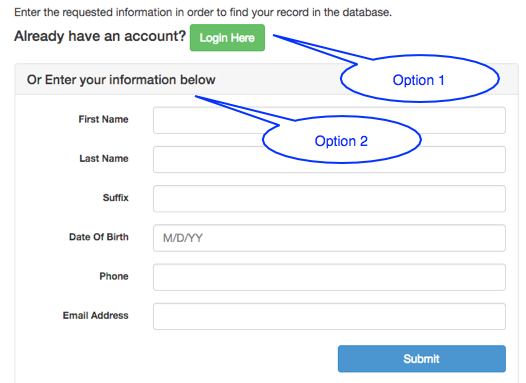 When you choose this method you will enter the information requested (see top image) to find your record in the database. If the person registering is a child, and the email address entered is not on his record but is on the record of someone else in his family, that will be considered a match. This is only true for children, not adults. Also, we include First, Middle, and Goes By in the search for the First Name, and we include Former in the search for the Last Name. Regarding the address - Address Line one (street address) and the Postal Code/Zip are required. However, the fields for Address Line 2, City and State are presented. If the address is valid with only the Street Address and Postal Code (if it is not missing an apt number, for example), our address verification process will add the missing information, and add the +4 to the Zip when that is submitted. But it is always good to provide the City and State just in case. We recommend that you always use the existing requirements; however, if you do elect to relax any requirements, those apply only to those registrants that are creating a new record in the database as described above. On the page with the Submit button is a check box to Create Account. If the registrant checks that box, when he completes his registration a My Data user account will be created for him and he will receive the New User Welcome email. If he checks that box and already has a user account, he will receive a different email letting him know that and allowing him to reset his password. He is enrolled in the registration organization. Depending on the Questions, he may be placed in one or more sub-groups. He receives an email confirmation when he completes his registration. A designated staff member will receive an email notification. The responses to the Questions part of the registration are captured and can be viewed on the Member Dialog and/or the Registration tab of the person. If he elected to Create Account, he will receive the New User Welcome email. Where do I find the answers to the questions a registrant answered in the registration? Many of the answers are recorded on the person’s Involvement > Registration tab. These are standard questions that are asked during a registration as well as during Check-In. The answers to other questions will be displayed on the registrant’s Member Dialog. You can also generate a Registration Report or Export for an individual or for the entire organization. These will contain the information you need regarding registrants’ registration information. The Report is a one-page per person report and the export contains one row per person. How can I find out the name of the church a registrant attends? Use the Extra Questions option which is found on the Registration > Questions tab of the organization. Use something like this: Name of church you attend. If a child is the registrant, you might want to phrase it like this: Name of Parent’s church. Can a person change his answers after he completes his registration? Include instructions in the confirmation email asking the person to reply to the email if he has changed his mind and wants to make a change. The Online Notify Person would then have to make the change for the person. Check “Allow Re-register” on the registration tab. This would allow the registrant to return and register, making different selections. Do not use Re-Register if there is a fee, as the person will have to pay both times. Can I send different confirmation emails to different sub-groups within an Organization? After registration has ended, you can send individual emails with instructions to the specific sub-groups. Just filter for a group and email them. You could also include all of the specific instructions for each group within the confirmation email, just clearly labeled. The registrant would ignore the instructions not pertaining to his group. You can set up your registration as a User Selects. In this case, each ‘group’ would be a separate organization instead of a sub-group within the same org. Instead of putting the confirmation on the Master Org, you would put create one on each org. Then each ‘group’ would receive a different confirmation. Does TouchPoint have conditional questions that will present different questions based on the person’s answers? No, we do not have that style of registration. However, with the types of registrations we offer, you don’t necessarily need that. Example 1: You want to put new students in Spanish I, and those that have already had Spanish I into Spanish II. Use User Selects type of Online Registration and name the orgs Spanish I (beginners) and Spanish II (return students). The registrant pre-qualifies himself by making his initial selection. Example 2: You want to fill teams based on age and gender. Use Compute Org By Birthday. You will select a gender and enter a birthdate range on each org, so that the system automatically places the person in the correct org. 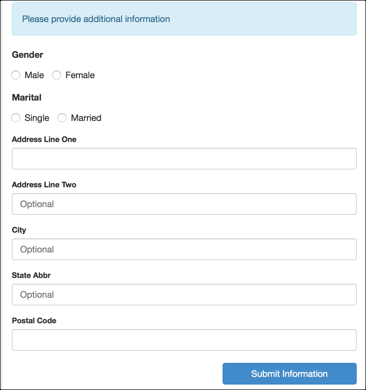 Can people register online if they are not already in the database? Absolutely. After the person enters the basic fields to find his record, if one if not found, he will just be asked for some more information, such as his street address and phone number. A new record is created when he completes his registration.